(Kitco News) - Are rumors true that Apple and Google are entering the auto market? Is the electric car dead once again? 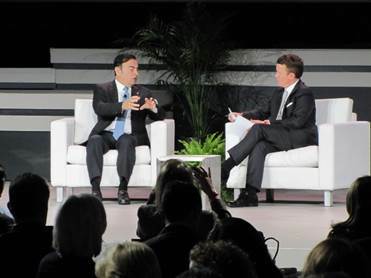 Carlos Ghosn, CEO of the Renault-Nissan Alliance gave answers to these questions at a press breakfast at this year’s New York International Auto Show. Although Apple and Google have grabbed people’s imagination with the idea of self-driving cars. Ghosn said that he doesn’t’ see them entering the fray. “Frankly, if a tech company today wanted to be in the car industry, take into consideration their market capitalization. They could buy any car maker,” he said. “They are all looking for the applications and all that can go into a connected car. And they want to do it in a way where they can maintain a very high margin. They are high profit companies and, as you know, unfortunately the car industry doesn’t share the same characteristics. Over the years the Alliance has not only grown to be one the world’s largest auto makers, it is also the largest producer of electric vehicles in the world. Ghosen spent some time reflecting on how far the EV sector has come and what he sees as its healthy future growth. “When I first spoke at this breakfast, it was in 2012, our industry was still focused on whether electric vehicles were part of our future. Nissan had just introduced the Leaf a year earlier and we had sold 30,000 units. Since then, the Renault-Nissan Alliance is leading the industry with more than 300,000 electric vehicles sold globally. Not as much as we had expected, but certainly a healthy start,” said Ghosen in his opening remarks. Where will the industry go from here? Will low gasoline prices, the lack of infrastructure and a small offering of cars with a better range mean the end of the idea? In his remarks, Ghosen highlighted the recent United Nations conference on Climate Change in Paris and reminded people of the UN’s commitment to reduce global warming by two degrees Celsius. He added that government around the world are starting to put limits on Carbon Dioxide emission, which means more opportunities for EVs to increase their presence in the marketplace. “This was conceptual, everybody signed in on it. Except that now everybody is working on how we can reduce the plus 4 to a plus 2 which is the agenda of COP22. Transportation is responsible for 70% of CO2 emissions. There is no way, no way, that we will reach anything around 2 degrees without a substantial reduction of CO2 from the transportation system. And the only obvious, known technology which allows that is massive electrification and electric cars. There is no other way,” he said. “To me it feels like we are at a dawn of a new spring in the auto industry, and I am excited to see how this new era unfolds,” he said. It is also the rise of a development for technology metals – precious metals, rare earth elements and strategic metals, including battery materials — that we have been forecasting in this series. 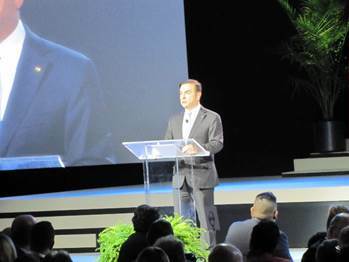 2020, according to other parts of Ghosn’s speech, will mark a tipping point in the industry, a point where sustainability, autonomous drive and connectivity will come together to create a new world of mobility.